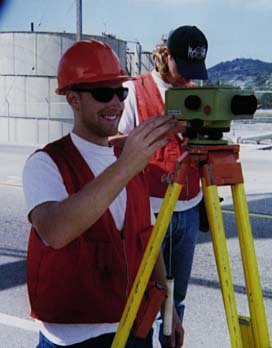 Undergraduate geology major Erik Ronald with the Leitz NA-3000 digital level on Ventura Avenue. The instrument emits an infrared beam that scans two bar-coded, 3 m-long, strut-supported invar leveling rods and determines the height difference between them to plus/minus 0.1 mm. The bar-coded leveling rods are shown in an accompanying photograph. Use of a a brand name here does not imply a product endorsement by the University of California or the National Earthquake Hazard Reduction Program. Copyright © Arthur G. Sylvester, 1997. 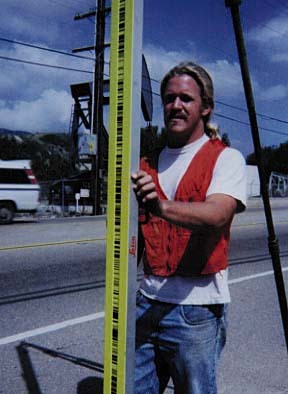 UCSB Seismotectonic Prognostications, Ltd., crewman, Frank Spada, with strut-supported 3 meter-long, invar, bar-coded leveling rod. Copyright © Arthur G. Sylvester 1997. 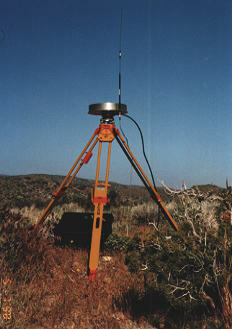 One of our three Ashtech Z-12 GPS antennae with black receiver box on the ground beneath the tripod. Attached whip antenna is for radio communcation to a similar base station set up several kilometers away. Photograph taken by Peter Morris, 1997. Return to the Title Page.